Save planet Mobius from impending doom from the nefarious Ashura and Dr. Eggman and thwart the plans of the Brotherhood of Metallix. This mod is based on a darker perspective of the Sonic the Hedgehog universe. You will have to find objects to use, solve puzzles, and interact with a number of NPC characters to progress through the story. Experience Sonic Physics; run on walls, loops, corkscrews and on water! The article states UT3, But it is really UT2004. Wow... they even put the boxart for UT2k4, and still said UT3. Will progress on that engine be done if the future? Thanks for the great tech demo!! As we are a very limited crew; the UT2004 version is the only one we are working on. UT3.....Possibly but i cant say hold your breathe. The bottom left picture they chose really shows off your level design skills. I played the tech demo a few months ago, and I have to say you did a really great job with it. The level design in particular was top notch. The many alternate routes to explore creates more replayability. I hope you try and add mutliple routes in all the levels. its must be nice to be in a Magazine. 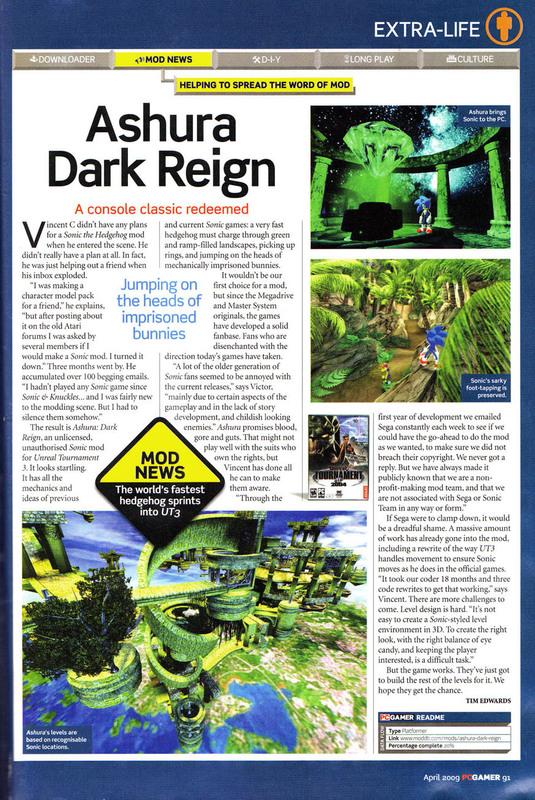 Belongs to PC Gamer UK magazine April 2009 issue.